The delightful pink is joyfully contrasted with a happy blue. The sling thus made is young, peppy and brightly styled, suiting the needs of adding colours to any ensemble. These bags are made out of repurposed Baragaon fabrics, sarees and more. The idea was to minimize waste and use the partially damaged materials to create something unique and useful. Baragaon Weaves is committed to sustainability. So much so that we’ve been hoarding on all the extra, damaged and left over fabrics for all these years. Hence this collection of backpacks and sling bags were designed and produced in collaboration with Rangbari – a brand dedicated to making vegan cloth bags. 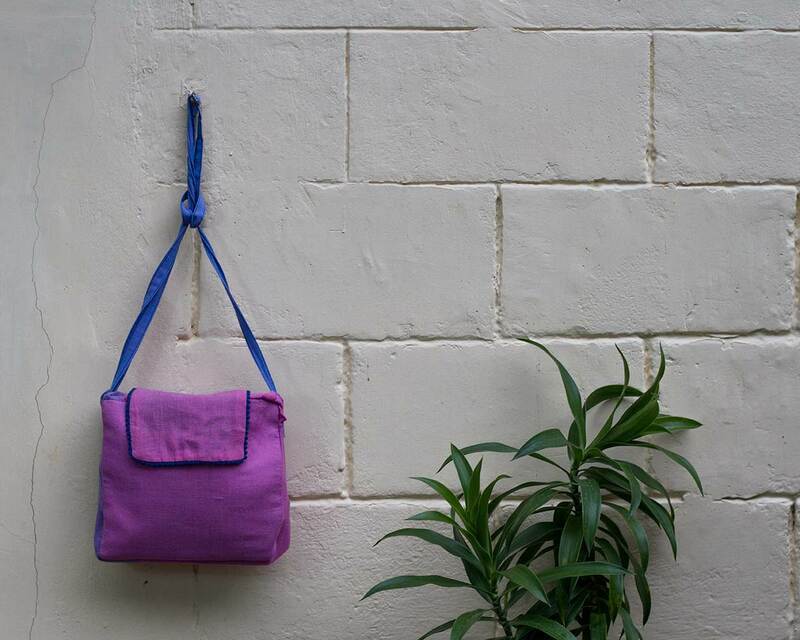 The Sling bags are made purely of fabric, with an adjustable strap. With one zipped pocket this is a fashionable and functional way to carry essentials. The bags are made from damaged fabrics & cut pieces but donot have any defects themselves. *Slight difference in pattern is possible in the designs made from sarees and dupattas due to differential placement.